The PaleozoicEra is the earliest of three geologic eras of the Phanerozoic Eon. It is the longest of the Phanerozoic eras, lasting from 541 to 251.902 million years ago, and is subdivided into six geologic periods : the Cambrian, Ordovician, Silurian, Devonian, Carboniferous, and Permian. The Paleozoic comes after the Neoproterozoic Era of the Proterozoic Eon and is followed by the Mesozoic Era. The Permian–Triassicextinction event, colloquially known as the Great Dying, the End-Permian Extinction or the Great Permian Extinction, occurred about 252 Ma ago, forming the boundary between the Permian and Triassic geologic periods, as well as between the Paleozoic and Mesozoic eras. 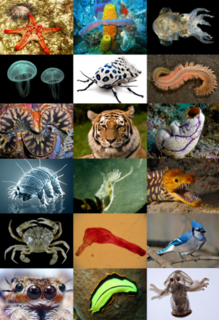 It is the Earth's most severe known extinction event, with up to 96% of all marine species and 70% of terrestrial vertebrate species becoming extinct. It was the largest known mass extinction of insects. Some 57% of all biological families and 83% of all genera became extinct. Because so much biodiversity was lost, the recovery of land-dwelling life took significantly longer than after any other extinction event, possibly up to 10 million years. Studies in Bear Lake County, near Paris, Idaho, showed a relatively quick rebound in a localized marine ecosystem, taking around 2 million years to recover, suggesting that the impact of the extinction may have been felt less severely in some areas than others. 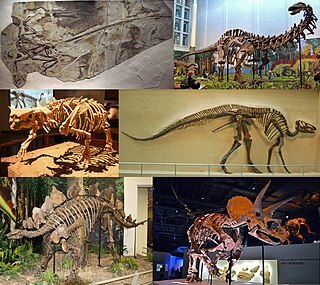 Dinosaurs are a diverse group of reptiles of the clade Dinosauria. They first appeared during the Triassic period, between 243 and 233.23 million years ago, although the exact origin and timing of the evolution of dinosaurs is the subject of active research. They became the dominant terrestrial vertebrates after the Triassic–Jurassic extinction event 201 million years ago; their dominance continued through the Jurassic and Cretaceous periods. Reverse genetic engineering and the fossil record both demonstrate that birds are modern feathered dinosaurs, having evolved from earlier theropods during the late Jurassic Period. As such, birds were the only dinosaur lineage to survive the Cretaceous–Paleogene extinction event 66 million years ago. Dinosaurs can therefore be divided into avian dinosaurs, or birds; and non-avian dinosaurs, which are all dinosaurs other than birds. This article deals primarily with non-avian dinosaurs. The phrase "Age of Reptiles" was introduced by the 19th century paleontologist Gideon Mantell who viewed it as dominated by diapsids such as Iguanodon , Megalosaurus , Plesiosaurus and Pterodactylus . Paleontology or palaeontology is the scientific study of life that existed prior to, and sometimes including, the start of the Holocene Epoch. It includes the study of fossils to determine organisms' evolution and interactions with each other and their environments. Paleontological observations have been documented as far back as the 5th century BC. The science became established in the 18th century as a result of Georges Cuvier's work on comparative anatomy, and developed rapidly in the 19th century. 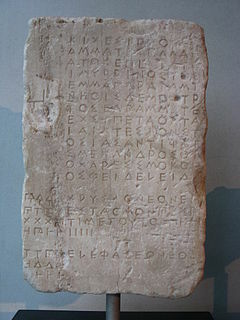 The term itself originates from Greek παλαιός, palaios, "old, ancient", ὄν, on, "being, creature" and λόγος, logos, "speech, thought, study". Gideon Algernon Mantell MRCS FRS was an English obstetrician, geologist and palaeontologist. His attempts to reconstruct the structure and life of Iguanodon began the scientific study of dinosaurs: in 1822 he was responsible for the discovery of the first fossil teeth, and later much of the skeleton, of Iguanodon. Mantell's work on the Cretaceous of southern England was also important. Iguanodon is a genus of ornithopod dinosaur that existed roughly halfway between the first of the swift bipedal hypsilophodontids of the mid-Jurassic and the duck-billed dinosaurs of the late Cretaceous. While many species have been classified in the genus Iguanodon, dating from the late Jurassic Period to the early Cretaceous Period of Asia, Europe, and North America, research in the first decade of the 21st century suggests that there is only one well-substantiated species: I. bernissartensis, which lived from the late Barremian to the earliest Aptian ages in Belgium, Spain, England and possibly elsewhere in Europe, between about 126 and 113 million years ago. Iguanodon were large, bulky herbivores. Distinctive features include large thumb spikes, which were possibly used for defense against predators, combined with long prehensile fifth fingers able to forage for food. John Phillips FRS was an English geologist. During 1841 he published the first global geologic time scale based on the correlation of fossils in rock strata, thereby helping to standardize terminology including the term Mesozoic, which he invented. The Cenozoic Era meaning "new life", is the current and most recent of the three Phanerozoic geological eras, following the Mesozoic Era and extending from 66 million years ago to the present day. The lower boundary of the Mesozoic is set by the Permian–Triassic extinction event, during which approximately 90% to 96% of marine species and 70% of terrestrial vertebrates became extinct. It is also known as the "Great Dying" because it is considered the largest mass extinction in the Earth's history. 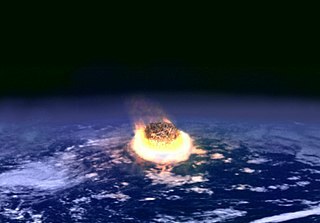 The upper boundary of the Mesozoic is set at the Cretaceous–Paleogene extinction event (or K–Pg extinction event  ), which may have been caused by an asteroid impactor that created Chicxulub Crater on the Yucatán Peninsula. Towards the Late Cretaceous, large volcanic eruptions are also believed to have contributed to the Cretaceous–Paleogene extinction event. Approximately 50% of all genera became extinct, including all of the non-avian dinosaurs. 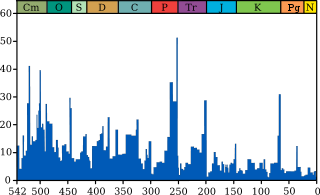 Following the bloom of the Middle Triassic, the Late Triassic, from 237 to 201 million years ago, featured frequent heat spells and moderate precipitation (10–20 inches per year). The recent warming led to a boom of dinosaurian evolution on land as those one began to separate from each other (Nyasasaurus from 243 to 210 million years ago, approximately 235–30 ma, some of them separated into Sauropodomorphs, Theropods and Herrerasaurids), as well as first pterosaurs. During the Late Triassic, some advanced cynodonts gave rise to the first Mammaliaformes. All this climatic change, however, resulted in a large die-out known as the Triassic-Jurassic extinction event, in which many archosaurs (excluding pterosaurs, dinosaurs and crocodylomorphs), most synapsids, and almost all large amphibians became extinct, as well as 34% of marine life, in the Earth's fourth mass extinction event. The cause is debatable;   flood basalt eruptions at the Central Atlantic magmatic province is cited as one possible cause. The Early Jurassic spans from 200 to 175 million years ago. The climate was tropical, much more humid than the Triassic. In the oceans, plesiosaurs, ichthyosaurs and ammonites were abundant. On land, dinosaurs and other archosaurs staked their claim as the dominant race, with theropods such as Dilophosaurus at the top of the food chain. The first true crocodiles evolved, pushing the large amphibians to near extinction. All-in-all, archosaurs rose to rule the world. Meanwhile, the first true mammals evolved, remaining relatively small but spreading widely; the Jurassic Castorocauda , for example, had adaptations for swimming, digging and catching fish. Fruitafossor , from the late Jurassic period about 150 million years ago, was about the size of a chipmunk, and its teeth, forelimbs and back suggest that it dug open the nests of social insects (probably termites, as ants had not yet appeared). The first multituberculates like Rugosodon evolved, while volaticotherians took to the skies. The Late Jurassic spans from 163 to 145 million years ago. During this epoch, the first avialans, like Archaeopteryx , evolved from small coelurosaurian dinosaurs. The increase in sea levels opened up the Atlantic seaway, which has grown continually larger until today. The divided landmasses gave opportunity for the diversification of new dinosaurs. The Early Cretaceous spans from 145 to 100 million years ago. The Early Cretaceous saw the expansion of seaways, and as a result, the decline and extinction of sauropods (except in South America). Some island-hopping dinosaurs, like Eustreptospondylus , evolved to cope with the coastal shallows and small islands of ancient Europe. Other dinosaurs rose up to fill the empty space that the Jurassic-Cretaceous extinction left behind, such as Carcharodontosaurus and Spinosaurus . Of the most successful was the Iguanodon , which spread to every continent. 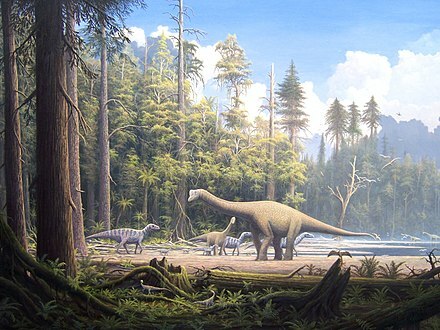 Seasons came back into effect and the poles got seasonally colder, but some dinosaurs still inhabited the polar forests year round, such as Leaellynasaura and Muttaburrasaurus . The poles were too cold for crocodiles, and became the last stronghold for large amphibians like Koolasuchus . 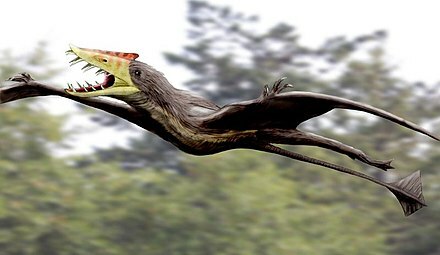 Pterosaurs got larger as genera like Tapejara and Ornithocheirus evolved. Mammals continued to expand their range: eutriconodonts produced fairly large, wolverine-like predators like Repenomamus and Gobiconodon , early therians began to expand into metatherians and eutherians, and cimolodont multituberculates went on to become common in the fossil record. The Triassic was generally dry, a trend that began in the late Carboniferous, and highly seasonal, especially in the interior of Pangaea. Low sea levels may have also exacerbated temperature extremes. With its high specific heat capacity, water acts as a temperature-stabilizing heat reservoir, and land areas near large bodies of water—especially oceans—experience less variation in temperature. Because much of Pangaea's land was distant from its shores, temperatures fluctuated greatly, and the interior probably included expansive deserts. Abundant red beds and evaporites such as halite support these conclusions, but some evidence suggests the generally dry climate of was punctuated by episodes of increased rainfall. The most important humid episodes were the Carnian Pluvial Event and one in the Rhaetian, a few million years before the Triassic–Jurassic extinction event. 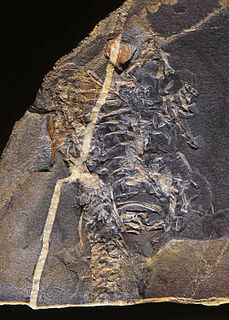 The climate of the Cretaceous is less certain and more widely disputed. Probably, higher levels of carbon dioxide in the atmosphere are thought to have almost eliminated the north-south temperature gradient: temperatures were about the same across the planet, and about 10°C higher than today. The circulation of oxygen to the deep ocean may also have been disrupted,  [ dubious – discuss ] preventing the decomposition of large volumes of organic matter, which was eventually deposited as "black shale". Recent research indicates that it took much longer for the reestablishment of complex ecosystems with high biodiversity, complex food webs, and specialized animals in a variety of niches, beginning in the mid-Triassic 4M to 6M years after the extinction,  and not fully proliferated until 30M years after the extinction. Animal life was then dominated by various archosaurs: dinosaurs, pterosaurs, and aquatic reptiles such as ichthyosaurs, plesiosaurs, and mosasaurs. Archosaurs are a group of diapsid amniotes whose living representatives consist of birds and crocodilians. This group also includes all extinct dinosaurs, extinct crocodilian relatives, and pterosaurs. Archosauria, the archosaur clade, is a crown group that includes the most recent common ancestor of living birds and crocodilians and all of its descendants. It includes two main clades: Pseudosuchia, which includes crocodilians and their extinct relatives, and Avemetatarsalia, which includes birds and their extinct relatives. Sauropterygia is an extinct, diverse taxon of aquatic reptiles that developed from terrestrial ancestors soon after the end-Permian extinction and flourished during the Triassic before all except for the Plesiosauria became extinct at the end of that era. The plesiosaurs would continue to diversify till the end of the Mesozoic. Sauropterygians are united by a radical adaptation of their pectoral girdle, adapted to support powerful flipper strokes. Some later sauropterygians, such as the pliosaurs, developed a similar mechanism in their pelvis. The Early Triassic is the first of three epochs of the Triassic Period of the geologic timescale. It spans the time between 251.902 Ma and 247.2 Ma. Rocks from this epoch are collectively known as the Lower Triassic, which is a unit in chronostratigraphy. The Early Triassic is the oldest epoch of the Mesozoic Era and is divided into the Induan and Olenekian ages. The Late Triassic is the third and final of three epochs of the Triassic Period in the geologic timescale. The Triassic-Jurassic extinction event began during this epoch and is one of the five major mass extinction events of the Earth. The corresponding series is known as the Upper Triassic. In Europe the epoch was called the Keuper, after a German lithostratigraphic group that has a roughly corresponding age. The Late Triassic spans the time between 237 Ma and 201.3 Ma. The Late Triassic is divided into the Carnian, Norian and Rhaetian ages. Gondwana, , was a supercontinent that existed from the Neoproterozoic until the Jurassic. Reptiles arose about 310–320 million years ago during the Carboniferous period. Reptiles, in the traditional sense of the term, are defined as animals that have scales or scutes, lay land-based hard-shelled eggs, and possess ectothermic metabolisms. So defined, the group is paraphyletic, excluding endothermic animals like birds and mammals that are descended from early reptiles. A definition in accordance with phylogenetic nomenclature, which rejects paraphyletic groups, includes birds while excluding mammals and their synapsid ancestors. So defined, Reptilia is identical to Sauropsida. The Jurassic Museum of Asturias is located in the area of Rasa de San Telmo near the parish of Llastres in the municipality of Colunga, Asturias, Spain. Though the municipality of Ribadesella was initially proposed, Colunga was chosen for the building site in the late 1990s. Several landmarks are visible from the museum including the Bay of Biscay, the Sierra del Sueve, and the Picos de Europa. Strategically located over a mount on the Rasa de San Temo, the museum is in the midst the Jurassic Asturias. ↑ "Mesozoic". Dictionary.com Unabridged. Random House. ↑ Dean, Dennis R. (1999). Gideon Mantell and the Discovery of Dinosaurs. Cambridge University Press. pp. 97–98. ISBN 978-0521420488. ↑ "Mesozoic". 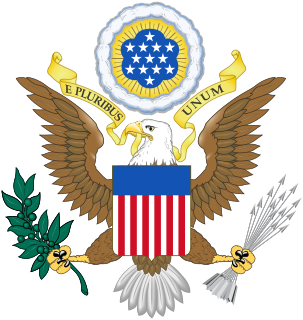 Online Etymology Dictionary. ↑ Gradstein F, Ogg J, Smith A. A Geologic Time Scale 2004. ↑ Alan Kazlev. "Early Triassic". unknown. Archived from the original on 27 April 2015. ↑ Graham Ryder; David Fastovsky & Stefan Gartner (1996-01-01). Late Triassic Extinction. Geological Society of America. ISBN 9780813723075. 1 2 3 4 Carol Marie Tang. "Jurassic Era". California Academy of Sciences. 1 2 Carl Fred Koch. "Cretaceous". Old Dominion University. ↑ Becker, Luann (2002). "Repeated Blows" (PDF). Scientific American. 286 (3): 76–83. Bibcode:2002SciAm.286c..76B. doi:10.1038/scientificamerican0302-76. PMID 11857903 . Retrieved 28 January 2016. ↑ Preto, N.; Kustatscher, E.; Wignall, P.B. (2010). "Triassic climates — State of the art and perspectives". Palaeogeography, Palaeoclimatology, Palaeoecology. 290 (1–4): 1–10. doi:10.1016/j.palaeo.2010.03.015. ↑ Robert A. Berner, John M. VandenBrooks and Peter D. Ward, 2007, Oxygen and Evolution. Science 27 April 2007, Vol. 316 no. 5824 pp. 557-558 . A graph showing the reconstruction from this paper can be found here, from the webpage Paleoclimate - The History of Climate Change. ↑ Berner, Robert A., 2009, Phanerozoic atmospheric oxygen: New results using the GEOCARBSULF model. Am. J. Sci. 309 no. 7, 603-606. A graph showing the reconstructed levels in this paper can be found on p. 31 of the book Living Dinosaurs by Gareth Dyke and Gary Kaiser. ↑ Stan Baducci. Mesozoic Plants..
↑ Sahney, S. & Benton, M.J. (2008). "Recovery from the most profound mass extinction of all time" (PDF). Proceedings of the Royal Society B: Biological Sciences. 275 (1636): 759–65. doi:10.1098/rspb.2007.1370. PMC 2596898 . PMID 18198148. Wikimedia Commons has media related to Mesozoic .